The issue of whether people should only sing folk songs from (and in) their own language has long been the subject of debate. Forget English schoolchildren learning how to slaughter Frère Jacques and concentrate on those who, for whatever reason, choose to learn sean-nós songs phonetically. The crux of the argument is basically that, if you do not speak the language as a native (or as good as one) then it is impossible to express via appropriate intonations the essential elements of a song’s message or understand the reflexive shifts in the song’s melody. 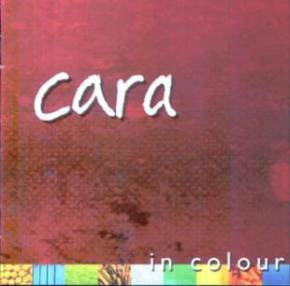 That argument rears its head with the release of In Colour, for Cara are a German quintet whose singers, Gudrun Walther and Sandra Gunkel, choose to sing English language folk songs in English. Now, there have been some mightily awful European bands who have endeavoured similarly (does the name Garafin jog any memories and, if the name does not, what about its version of Back Home in Derry? ), but, unequivocally, Cara does not fall into that category. The first reason is that lead vocalist Gudrun actually has a tremendous voice and one clearly capable of expressing the actual import of the various elements of the lyrics she sings. The second is that, instrumentally, Cara adds the kind of support essential to reinforcing the message of the songs. Those instrumentalists are Claus Steinort (flute, low whistle and concertina), Gudrun on fiddle and viola, Jürgen Treyz on an assortment of guitars and dobro, the redoubtable Rolf Wagels on bodhrán and percussion and, lastly, Sandra on keyboards and flutes. Together they combine to provide a compelling brew whose elements include the aforementioned songs (The King and the Fair Maid, Three Ravens, Sir John and False, False) together with mellifluous playing of an assortment of traditional Irish tunes as well as some which are self-composed or written by friends. Overall, this is a very coherent album, but there are two caveats. I’m not sure why Gudrun chose to change the wonderful melody of The Monroe Brothers version of Sailor Boy and, secondly, singing well in English cannot be equated to writing well in that language. As such, the closing track, There’s a Light employs several dozen trite phrases from The Songwriter’s Book of Clichés (which, if it hasn’t been written, ought to be penned by someone quickly – all offers welcome). Sorry, but this old hack firmly resists the import of lines such as “Love can set us free”. No, no, no, as all Joy Division fans know full well, “Love will tear us apart”! Click here for more information on Cara.